Autumn is on its way! We, like many wedding venues in Lancashire, are seeing a real increase in weddings for the autumn season which has, in part, been inspired by some amazing colours in wedding décor that are really on-trend this year – bronze, gold and burnt orange. Thankfully this is set to continue, and armed with our autumn wedding planning tips, you will be able to make the most of this incredible wedding season. The season brings with it the richest of colour palettes which can be brought together into a stunning wedding scheme. This year we are seeing lots of autumnal wild flowers with colour schemes incorporating deep reds, orange, purple, burgundy, dusty pink, cream and gold, and dark green foliage including eucalyptus, red berries and lots of twigs. There will be an abundance of flower displays on the tables of wedding venues in Lancashire, and the bridal bouquets will be full and cascading down to the floor. The richer the colours, the better here. These don’t have to blow the budget though, as the use of less expensive wild flowers and twigs will help with costs. 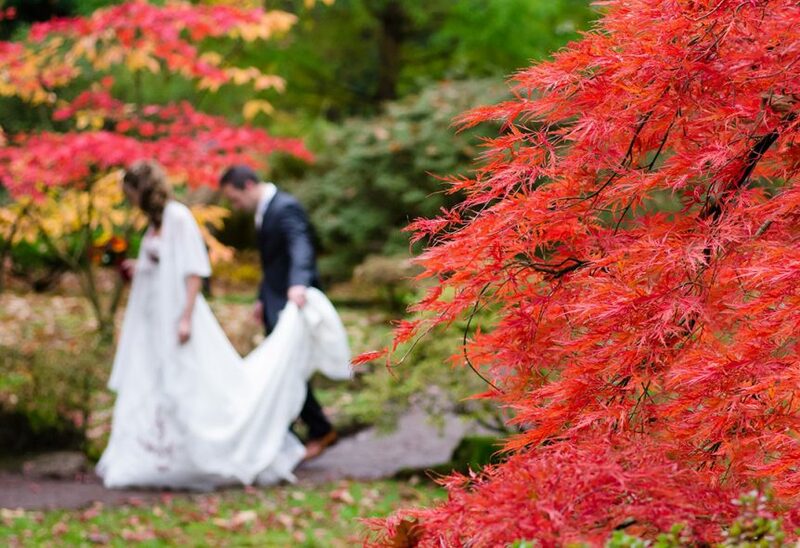 From bo-ho to formal affairs, autumn really does suit all kinds of weddings. As for table decorations – our autumn wedding planning tips have to stress that – ‘all that glitters is gold’! It will be partnered with complementary more neutral shades for autumn, but really this has been THE colour of the year. From tall candles and candelabras, to napkin rings to gold linens, it has really caught-on and suits all types of weddings. You can also think about incorporating beautiful red apples, pomegranates, pears and other seasonal fruits into the display to really bring alive the autumn theme – and it’s edible! We also advise couples to consider having some of their pictures taken outside to capture the rich tonal colours of the leaves and backdrop of The Barton Grange Hotel gardens, but don’t leave the photographs too late in the day, as the sun starts to set a lot earlier and the light can fade fast. When it comes to food and drink, now’s the time couples planning weddings in Lancashire this autumn can introduce a new twist to the usual menu, with ‘his and hers’ spiced cocktails, warming pumpkin soup served in tall mugs or serve locally produced craft beers with a rich Lancashire hot pot – perfect for the chilly evenings. One trend we will see this autumn is approaching the seating plan a la dinner party – so intimate tables with fewer chairs allowing guests to talk to everyone on the table and it’s easy for the bridal couple to move around the room to say hello. For couples planning weddings in Lancashire in September or mid-November, take my advice and embrace the autumn seasonal colours and be inspired by the changing weather with more warming cuisine, and you’ll create a wonderful autumn wedding day to remember.